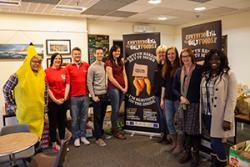 ‘The Ugly Foods Shop’ managed and run by Bangor University students for the last four weeks has been a great success. The enterprising team of students exercised their creativity and business acumen to test trade their idea in collaboration with Bangor City Council. The team sold fruit and vegetables which do not meet the conventional beauty standards required to allow them entry onto supermarket shelves because of their size or irregular appearance but that are perfectly wholesome in other respects. The shop offered customers the chance to save them from landfill and buy at a cheaper price than from conventional retailers. 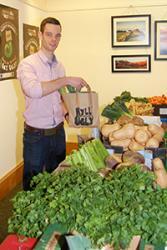 Goods on offer included ‘Soup in a Sack’ and freshly made smoothies as well as loose fruit and vegetables. The shop brought a new lease of life to Bangor’s Deiniol Shopping Centre as well as allowing students to develop vital enterprise and employability skills that will be invaluable in the world of work. Skills developed were not limited to things like pricing and selling but a whole range of other commercial skills such as team working, problem-solving, customer service and marketing to name but a few. 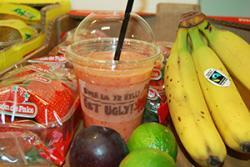 The response from customers of the shop was very positive and due to popular demand it is planned for the shop to re-open its doors in September 2015 with students looking forward to developing the Ugly Foods brand even further. Dan and Rhi Wilmott, also from the School of Psychology were invited to have an Ugly Foods Shop stand at the recent Procurement Week conference in Cardiff and also presented at the Santander University Entrepreneurial Awards held at the University recently. Diane Roberts and Aaron Owen, the Santander Universities team at Bangor University took a great interest and met the team: Peter Helsby (as a banana); Dan Taylor, Kate Isherwood, Emma Cheeseman, Zoe Griffiths, Lowri Owen & Bukola Adetonwa.The B-Enterprising team who helped to coordinate this venture are very grateful to Bangor City Council for extending this opportunity to students of Bangor University and to the Welsh Government for helping to fund it.